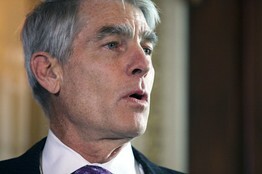 Democrats withdraw a referendum to protect Senator Mark Udall. Democratic Congressman and environmental activist Jared Polis on Monday announced—through gritted teeth—that he is withdrawing his support for two ballot initiatives that would have effectively halted the drilling technique known as hydraulic oil- and gas fracturing in the state. Mr. Polis has poured millions of dollars of his own cash to promote the measures, which the anti-fracking left has advertised as a national showdown over natural gas. Colorado Democrats were desperate to kill the ballot measures lest they contribute to the defeat of Governor John Hickenlooper and Senator Mark Udall. Colorado sits atop one of the richest shale plays in North America and is already among the top natural-gas producing states. One industry study found that in 2012 oil and gas contributed some $30 billion to the Colorado economy, and the industry supports thousands of jobs. A Quinnipiac poll in November showed that most Coloradans support fracking and a mere 34% oppose it. Independents back it 51% to 32%. The Polis measures had inspired business groups to back a pro-fracking initiative, which meant the issue would have been at the center of the fall debate. Oil and gas groups planned to spend $20 million to defeat the anti-fracking initiatives, which would have banned drilling within 2,000 feet of homes or hospitals and would have given local governments effective vetoes over new wells. Fracking has become a new fault line in the Democratic Party, with rich greens squaring off against workers who want the well-paying jobs that fracking provides. Messrs. Hickenlooper and Udall have spent months dodging a clear position. The Governor had floated a possible legislative compromise, only to drop it last month when he couldn't get the Democratic legislature to pass new restrictions. Mr. Udall has been pressured to take a stand by his GOP challenger, Congressman Cory Gardner, who is pointing out the economic benefits from fracking in North Dakota and Texas. Mr. Udall ran in 2008 as a full-throated green-energy champion, and only as Mr. Gardner has gained on him in the polls has he discovered the political virtues of fossil-fuel jobs. The Polis retreat is best understood as an attempt to save Mr. Udall and perhaps a Democratic Senate. The press corps is portraying all of this as canny tactical politics, which it could turn out to be. But the retreat also shows that the anti-fossil fuel absolutism that dominates the Democratic left lacks a majority even in a state that President Obama carried twice. Mr. Polis had presented his initiatives as a national referendum on fracking and in that sense he was right. Democrats are now hoping to duck the issue through the election and then use the blue-ribbon commission to give them cover to limit fracking next year. The Colorado energy fight echoes the national Democratic energy strategy. Majority Leader Harry Reid refuses to allow Senate votes on numerous pro-energy measures that have bipartisan support. This allows Democrats like Mr. Udall to claim to support energy jobs even as the White House blocks the Keystone XL pipeline, more drilling permits and more natural gas exports. Voters shouldn't be fooled by the Colorado ruse. Mr. Polis wanted a referendum on fracking, and the way to give him what he wanted is by defeating the Democrats he is now trying to protect from the political consequences of his policies. A new study shows the Obama program cost car makers money. The annals of failed government programs always yield new surprises, and the latest is one for the ages. The White House can't even pay people to buy new cars without harming car makers. The basic economic illogic of Cash for Clunkers is that you can't create wealth by destroying serviceable assets and then force-feeding consumer spending on replacements. But the saving grace was supposed to be that at least the auto makers benefited from a government-sponsored firesale on their products. Now that illusion has collapsed too. If Cash for Clunkers was "the best possible" stimulus, maybe that helps explain why the economy is still limping along six years later.